Does personalization impact the search positions shown in Search Analytics within Google Search Console? It does, but it is definitely something that confuses many site owners when they cannot match up what Search Analytics reports for positioning info with what they see in the live search results. Google takes into account the search results for all users, and personalization will impact the positioning. For example, if Google knows that you visit a site frequently when searching in a topic area, Google will then surface results from that particular site much higher in the search results, when for someone else, it might show that same site much lower in the search results. And it isn’t always just a jump up of one or two spots, personalization can jump up a site from somewhere on page two to page one. Likewise, you could see your site appear lower than it appears in the unpersonalized search results, again because perhaps one of your competitor’s tends to be visited a lot, and those results could push your own site lower in the search results when personalization is taken into account. When doing ranking or vanity checks, many site owners don’t take into account that Google will naturally surface their site higher than the average searcher might see in the search results. Is the average position in Search Console based on personalized search results? Yes. It’s based on whatever was actually shown to the user. So it’s not a theoretical ranking that your site would be ranking for this query at this position but it’s really based on what we’ve shown in the past to users for those queries. 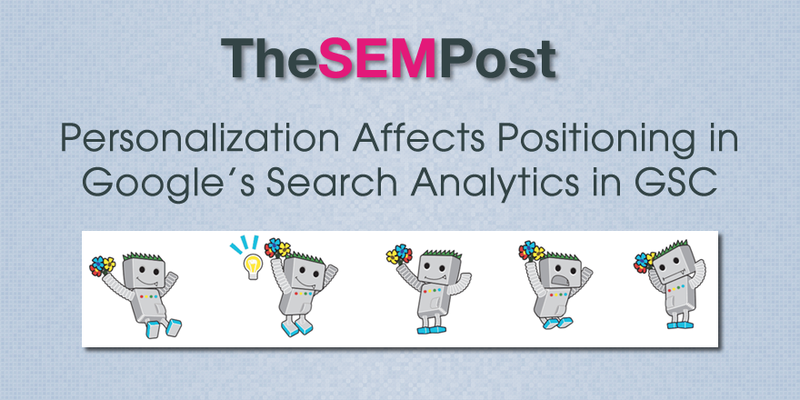 There had been a lot of confusion about how Search Analytics determined positioning, and there is a help document on it that Google added to clear up some of the information. Don’t forget when you do your own searching, especially for your own sites, you will see them higher in the search results than they appear for others. To see unpersonalized results, you need to either search using incognito mode in Chrome, or click on settings to remove personalized results.